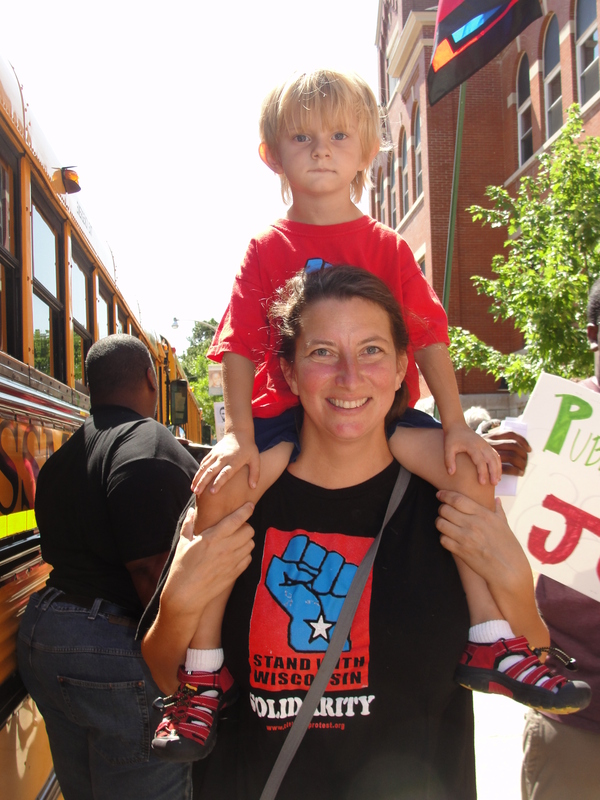 Wisconsin Network for Peace and Justice has arranged for buses from Madison to West Allis. Bus fare is $15, but no one will be turned away for lack of funds. Call 608-250-9240 to reserve your seat. The WI Bail Out The People Movement has been receiving many inquiries from the corporate media regarding the anti-Nazi counter-protest in West Allis Sept. 3, 2011 (see below for more information, flyers, posters & placards.) Members of the general public have also been contacting us as well with questions regarding the Nazi’s, Hitler, fascism etc. Thus we are making available the following resources which give a clear, honest and accurate rendering of the origins and danger of Nazism and other forms of fascism. The Rise Up! Wisconsin Collective invites you to submit to an anthology which will give expression to the diverse origins and broad participation in the struggle for Wisconsin’s future. Since Gov. Walker’s assault on us all, there has been increased media attention on our state be…cause of the mass protests by organized labor, community groups, and students. Recent attention has turned to the electoral field as recall elections proceed. But very little is being written or published that approaches the politics and history of Wisconsin’s popular uprising through a radical lens. By “radical,” we mean getting at the root of a problem and transforming it into a community we can all participate in and be a part of. It also means viewing the assault by the Republicans and corporations as tied to the restructuring of global capitalism, and the parallel movements for survival by Wisconsin’s marginalized communities. Our hope is to create an anthology that illuminates the origins of Wisconsin’s popular struggle as a consequence of interlocking grassroots work. We are especially interested in hearing from progressive workers as well as organizers from immigrant, indigenous and communities of color, LGBT, disability and women’s communities. What we hope to show is that this is not just a “union” struggle, in a restrictive sense, but a struggle to redefine progressive politics itself. Please send submissions and a short bio including contact information (name, email, or the best way to contact you) in Word or PDF as well as within the body of the text to: riseupwi@gmail.com Please put “Rise Up! Wisconsin Anthology submission + [your last name]” in the subject line. * We recommend keeping your submissions to under 10 pages – please contact us if you intend to submit something larger. * We accept previously published work, but preference will be given to voices that have fewer resources for having their voice in print. Deadline for Submission: October 1, 2011. Please forward this call to those you think would be interested! Here is the timeline for the L.U.V. BRIGADE’s Sept. 3, 9:15 a.m.-12:15 p.m. activities at Red Arrow Park (across from the Milwaukee city hall). After the clean up of the park, there will be transportation to West Allis city Hall for the counter-protest against the Nazi’s. Anti-Nazi counter-protest mobilizing this week, Join us! This week (the week of August 28-Sept. 3) West Allis residents and progressive activists will hit the streets of West Allis to distribute “Jobs Not Hate” anti-Nazi counter-protest flyers and posters. 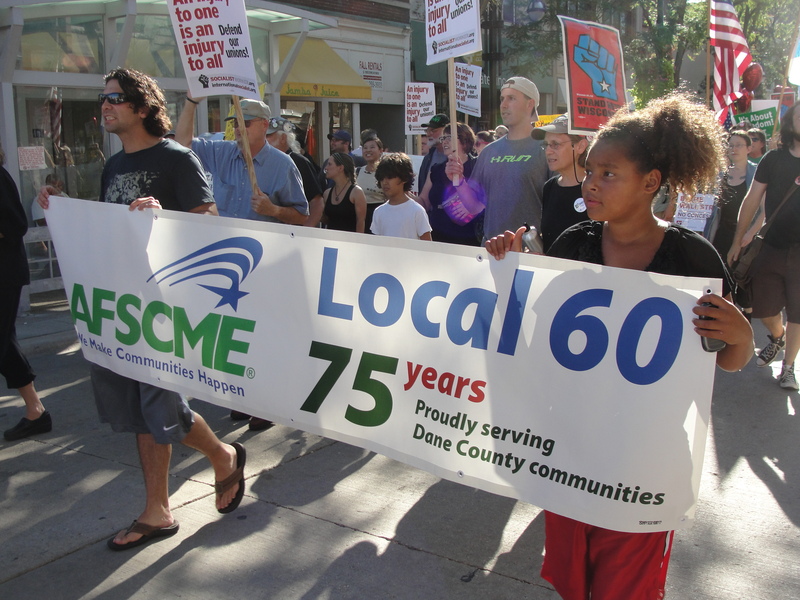 Look for the “West Allis Says NO To Racism & Union-Busting” banner. We will be talking to residents, small business owners and others in efforts to mobilize for the “Say NO To Nazi Hate” counter-protest rally scheduled for 1 p.m. Saturday, September 3 at the city hall in West Allis. If you are interested in distributing leaflets, going door-to-door, helping at the counter-protest and/or other tasks, contact the WI BOPM at: 313-559-7074 or Peace Action Wisconsin at:(414) 964-5158. Don’t let the Nazi’s be unopposed when they come to West Allis. Defend the unity that brought a hundred thousand people to Madison to fight the union-buster Walker. Say NO to racism! We need JOBS not Hate! Join the counter-protest against the Nazi’s.